(Bloomberg) -- Emirates NBD PJSC’s Group Chief Financial Officer Surya Subramanian, who steered the bank through some of Dubai’s largest restructurings, is set to leave after almost nine years. The former Standard Chartered Plc banker will return to Singapore to pursue family interests after helping to find a successor, Dubai’s biggest lender said in a statement on Wednesday as it posted a 15 percent rise in quarterly profit. Since Subramanian joined, the bank’s profit has grown at a compound annual rate of 20 percent, while assets have almost doubled. Emirates NBD was among the hardest hit by Dubai’s debt crisis in 2009 after one of its companies sought to restructure about $26 billion of debt. The bank was forced to take billions of dollars in loan loss provisions when state-owned firms such as Dubai Holding LLC and Dubai World Corp. delayed debt repayments and extended loan maturities. 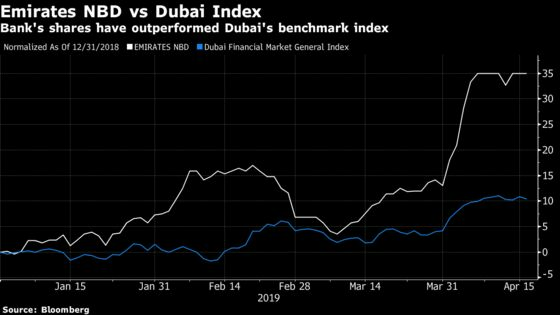 Emirates NBD on Wednesday said first-quarter profit rose to 2.74 billion dirhams ($747 million) from 2.39 billion dirhams, beating a 2.5 billion-dirham mean estimate of three analysts compiled by the lender. Impairments rose to 570 million dirhams from 440 million dirhams. The shares were down 0.4 percent at 11.95 dirhams at 12:22 p.m. in Dubai, while the benchmark index was up 0.7 percent. The stock has risen 34 percent this year compared with an 11 percent gain in the main index. Emirated NBD, which is in the process of buying Turkey’s Denizbank AS from Sberbank PJSC, may save as much as $700 million in a revised deal after a slump in the lira. It’s expected to be the Dubai bank’s biggest acquisition and the transaction is set to close this quarter. In April, Emirates NBD sold about half its stake in its card payments processing unit Network International in a London initial public offering.